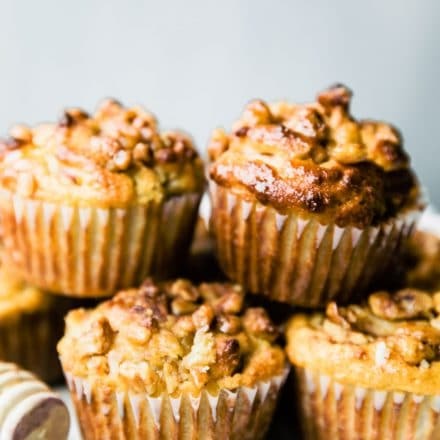 Ginger Spiced Pear Muffins with a sweet nutty topping! Grain free, paleo option. 1/4 cup to 1/3 c honey. Plus an extra for topping. Preheat oven to 350F. Line a muffin tray with liners or spray with oil. Next, slice the stem off the pears and proceed to dice into smaller pieces. Place in medium bowl and then mix in your spices and ginger ale or club soda and honey. Let that soak. In another bowl, sift your flours and starches together. Mix in your baking powder and salt. Whisk together your eggs until fluffy then gradually fold into your dry flours mix. Mix in your melted butter. Gently pour your pear and ginger mixture into the egg/flour batter bowl. Mix gently until batter is thoroughly blended. Pour batter into oiled muffins cups, set aside. If You have candied walnuts already prepared, go ahead and crush them in a small bag then sprinkle on top of each muffin. Sprinkle with extra cinnamon. If you don’t have candied walnuts, simply crush your walnuts in small bag, pour into a bowl, then mix the walnuts with a pinch of cinnamon and 1 tbsp or more of honey. Scoop these on top of the muffins before baking. Place muffins in oven on center rack and bake at 350F for 22-25 minutes or until muffins are golden brown. Remove from oven and Let them cool 10 minutes before removing from pan . Gingerale substitutes- sparkling water, Zevia gingerale, a ginger Kombucha, etc. How to check for ripeness in Pears – check for ripeness at the thinner stem end — it should be yield to soft pressure. No Nutty topping? No prob! You can use granola or any other nut of choice. Or omit all together!